Typical connections from an HDMI source such as a Blu-ray player; DVR / Cable or satellite box to an HDMI display would be by using an HDMI cable. In cases of going longer distances, HDMI can be transported over Ethernet Cat 5e / 6 / 7 cables using an HDMI Extender over Cat cable. HDMI Extending from 50ft, 130ft, 200ft and up to 330ft. An HDMI Extender over Cat 5e / 6 / 7 cables consists of a Transmitter and a Receiver. Additionally, you can extend other signals such as IR remote control commands, USB and RS-232. It is recommended that you use the best quality solid cable available. A Solid cable is that each of the 8 wires in the Cat 5e / Cat 6 is made by a single solid copper alloy wire. Solid copper alloy has better conductivity than strands. Therefore, solid cable would help providing better performance and farther in distance than a regular stranded cable. Cat 6 shielded and Cat 7 yields best performance and most immune to interference. Cat 6 UTP is good however may be prone to interference if cables are routed near other electrical sources or cables. 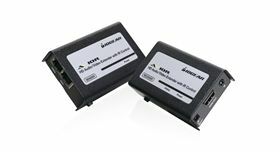 The ideal low-cost and reliable solution of distributing HDMI over long distances that traditional cables are unable to address. IOGEAR's GVE320 powered HDMI Audio / Video Extender gives you the distance between the 1080p HDMI media source and the HD display unit by up to 130 feet with 3D support. 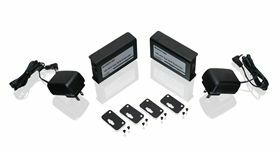 It consist of a local sending unit and remote receiving unit connected by two standard solid Category 5e/6 twisted pair solid Ethernet cables. Additionally, you can extend up to 200 feet* at 1080i resolution. 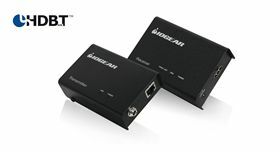 IOGEAR's HDMI Extender gives you the distance between a 1080p media source and an HD display unit by up to 130 feet with 3D support and up to 196 feet with 1080i support. It consists of a local sending unit and remote receiving unit connected by two standard solid Cat 5e/6 twisted pair solid Ethernet cables.